Deal of the Day: Save 45% on bObsweep bObi Pet Robotic Vacuum Cleaner for 1/03/2019 only! Today you can save 45% on the pet robotic vacuum cleaner from bObsweep. Clean up your pets messes with a robot vacuum that is specially made for fur-filled homes. Because dogs and cats cant clean up after themselves, bObi springs to life with its TurboLift vacuum and back-to-back brushes. The dustbin is fully washable, so you can clean out every last pet hair. bObi comes with the bObi blOck accessory, which lets you create an invisible wall across the floor. bObi comes with a FullCommand remote to give you control of navigation and schedule automatic cleaning for up to 7 days. bObi blOck creates an invisible wall so you can section off a space. bObi is backed by a 2-year limited warranty, 5 years of subsidized service, and an amazing, US-based support team. Two winners will receive the Robotic Vacuum Cleaner valued at $199.00. The Coredy smart sweeping robot is specially designed for hard floors ( wood/tile/mable/laminate). With a smart water tank installed, this high suction vacuum cleaner robot pull deeper dirt and grime off your floors and maintain them gleaming every day. Two side brushes, and high powerful suction ensure a thorough clean. Dirt is effectively loosened and extracted from the floor, then vacuumed into the dust collector. Low-profile design is 7.0cm thinner than comparable models and slides under furniture to eliminate hidden dirt. Whether it’s coffee tables or couches, the smart sweeping robot slips into areas other vacuums can’t reach. This giveaway is in no way endorsed, affiliated, or associated with Facebook, Twitter or any other Social Media Networking Site. You are not eligible if you have won a prize from the sponsor in the last 12 month. This Giveaway is valid in the United States Only and Entrants must be 18+ years of age to enter. This giveaway event will end at 11:59 PM (EST) 12/25/17. The winners will have 48 hours to email their information back to las93063 at gmail dot com or a new winner will be drawn, you may want to put this email address as safe as it could go to spam. The sponsors are each responsible for shipping of the above prizes. No blog associated with this contests are responsible for prize fulfillment. If you would like to be a sponsor in a giveaway like this please email Laura Smith at las930 (at)gmail (dot) com. If you take an entry you must stay following for the entire contest or you will be disqualified. Deal of the Day: Save 20% on Hoover Shoulder Vacuum Cleaner for 1/18/2017 only! Get powerful back-pack performance with 9.2 pounds. lightweight convenience. Its chiropractor-designed harness reduces strain and increases productivity. Get 66dBA quiet operation without disrupting the environment around you. And switch outlets less often with the extra-long 48 feet 3-wire quick change cord. Deal of the Day: $200.00 & FREE Shipping. Lightweight for less fatigue, only weighs 9.2 lbs. The unit can get warm after being used for a long time. This can be a problem if you’re trying to use it in the summer. Deal of the Day: Save 46% on Black & Decker Automotive Handheld Vacuum Cleaner for 06/07/2016 only! 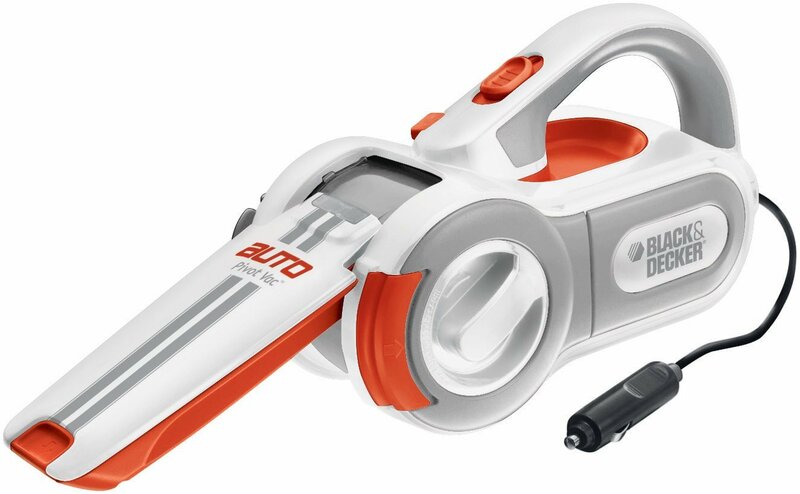 This 12-volt handheld automotive vacuum cleaner with pivoting nozzle; Cyclonic action keeps the filter clean and suction power is constant. Deal of the Day: $29.99 & FREE Shipping on orders over $49. The brush tool is located below the power cord in a compartment This comes equipped only to plug into the car or any vehicle. This comes equipped only to plug into the car or any vehicle. Deal of the Day: Save 50% off Hoover Linx Cordless Stick Vacuum Cleaner for 7/21/2015 only! Today only, transform everyday cleaning with the Hoover Linx. This sleek, versatile stick vacuum delivers upright performance with Lithium-Ion battery power. It’s the only stick vacuum with Hoover WindTunnel technology and cyclonic filtration. Now you can clean-up without ever having to search for an outlet.